Staff from several local organisations, including About Youth and Clovenstone Community Centre, will be taking part in a special football match where workers from different agencies, including Edinburgh Council, third sector and Police Scotland will be playing against a group of young people from Saughton. This is the third year the match has been organised, the last two have been a great success with several of the young people continuing to work with About Youth and Lifelong Learning in different ways. 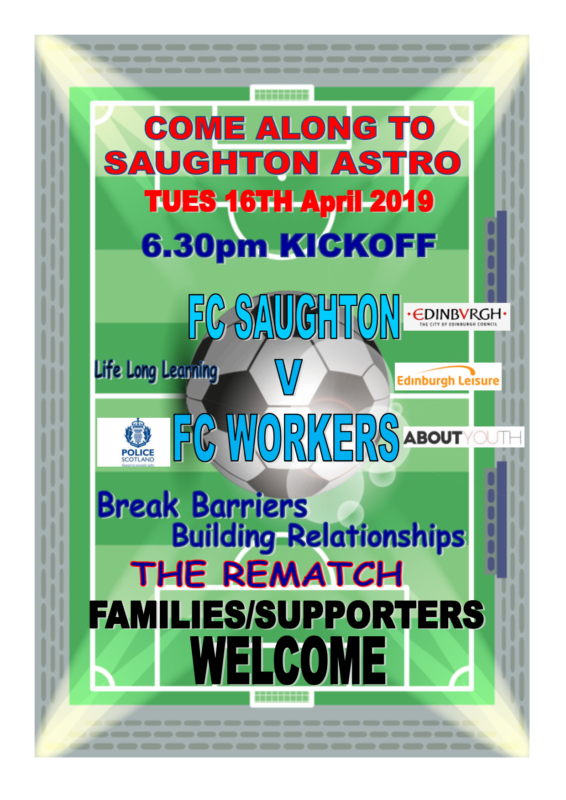 The match will take place at Saughton Astroturf on Tuesday 16 April 2019, 6.30pm kickoff. It is hoped it will be a fun event and will continue to build better relations between young people and the organisations involved as well as the rest of the community. Families and friends are welcome to come and support either or both teams!